The Meet The Rolling Stones in Paris Sweepstakes is only to legal U.S. residents of the fifty (50) United States and the District of Columbia who are twenty-one (21) years of age or older. The Meet The Rolling Stones in Paris Sweepstakes ends on September 12 at 11:59 p.m. PT. To enter, visit IcelandicGlacial.com/RollingStones and follow the on screen instructions to complete an entry form. One (1) Grand Prize is available. 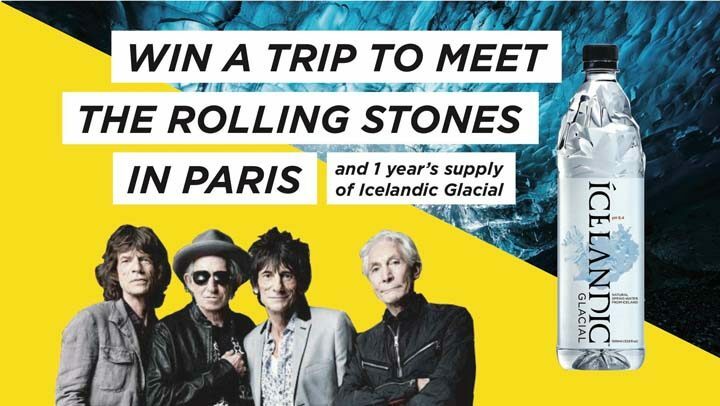 The Grand Prize winner will receive airfare for two (2) to Paris, France (CDG) from their home airport, a three (3) night stay at a hotel in Paris, two (2) VIP tickets which include premium seats and a meet and greet with The Rolling Stones, and one (1) year’s supply of Icelandic Glacial water. Approximate Retail Value (“ARV”) of the Grand Prize: $7,500.